After the initial few weeks of jubilance about being out of school for the summer, the kids may soon tire of video game controllers, ice cream headaches, and staying outside until the street lights come on. Banish that boredom by planning a summertime adventure in New York State. We have five awesome summer weekend getaway ideas that are fab for the whole fam, from beachside to bayside to inside our great museums! Day 1: Spend a day of fun in the sun at Otsego Lake! Captain your own pontoon boat with the help of Time Out Boat Rentals, spend the day fishing, or head to Glimmerglass State Park for swimming and scenic hiking. Whatever you decide to do, you’re sure to work up an appetite. For flavorful American cuisine grab a bite at Mel’s at 22 or head to Origins Cafe for a locally-sourced, seasonally fresh menu set in a real greenhouse. Day 2: Baseball fan or not, if you’re in Cooperstown you have to go to the National Baseball Hall of Fame and Museum. From Derek Jeter’s cleats to a brick from the tavern owned by Babe Ruth, this place has everything even the most die-hard fan could hope to see. 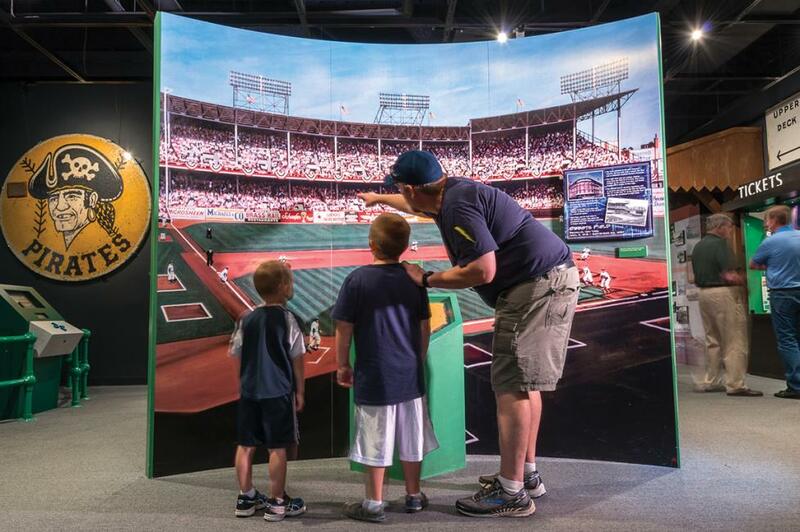 It’s the ultimate destination for all things baseball, and a wonderfully interesting trip into American culture and history—not to mention a great photo opp for your kids! Check out Doubleday Cafe for a family-friendly atmosphere with plenty of tasty burgers and sandwiches or Danny’s Market—not your average deli, according to This Is Cooperstown—for lunch. Day 3: You don’t need to be an animal lover or history buff to fall head-over-heels for The Farmers’ Museum. Experience the 19th-century historic village, rotating exhibits, family-friendly petting area, horse-drawn carriages, and more. Of course, you can also let your kids spend the day knocking it out of the park at Doubleday Batting Range. Open daily in spring and summer, it&apos;s complete with TRU-PITCH batting machines, which are used by many MLB teams. Accommodations: Try the Otesaga Resort Hotel. More than a century old, this resort is chock full of history and breathtaking views of Otesaga Lake. Bonus: there&apos;s a full 18-hole championship golf course right on site! With its idyllic rolling hills and sparkling waters, the Finger Lakes is one of New York State’s most beautiful regions. Known for its award-winning wineries, jaw-dropping waterfalls, and winding gorge trails, the region offers plenty to do for people of all ages, making it a great choice for a family vacation. Seeing all of the area’s attractions in one weekend is nearly impossible, so we recommend choosing a home base central to the sights you most want to see: Watkins Glen on the southern shore of Seneca Lake—which offers way more adventure than you&apos;d expect from a town this size. Day 1: Start the trip strong with two of the most exciting things to do in the Finger Lakes. 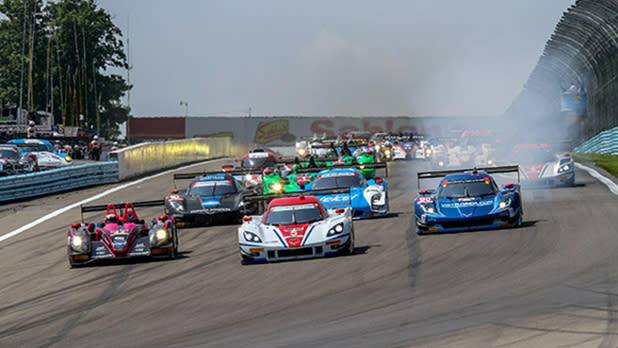 Watch NASCAR at Watkins Glen International racecourse where you can even drive two laps around the track with your own car for an extra adrenaline rush. To settle down post-race, hike the calming trails of Watkins Glen State Park and surround yourself with natural beauty while chasing 19 different waterfalls. In 2015, Watkins Glen was in the top 3 best state parks in the country as voted by USA Today readers. Day 2: Shop till you drop at the next lake over. The newly reconstructed Ithaca Commons is a four-block pedestrian-only zone in downtown Ithaca. The Commons boasts more than 100 unique shops, restaurants, street vendors, and street entertainers. After you&apos;re done hitting the stores, stop for dinner. With restaurants representing a diverse range of cuisines in the Commons and bordering Aurora Street (commonly known as Ithaca’s “Restaurant Row”), there’s something for every taste. Day 3: Traveling with kids doesn’t mean you can’t sample some of the famous Finger Lakes wine. Everyone’s got to eat, so stop by a vineyard for lunch. Fox Run Vineyards, just one of many award-winning wineries on the Seneca Lake Wine Trail, has tables on their back patio—bring your own picnic lunch or enjoy the cafe&apos;s wine and cheese boards, tacos, flatbread pizzas, and more. Spend the afternoon at the Farm Sanctuary giving some love to hundreds of rescued farm animals in the form of belly rubs and food, while also learning why the animals were rescued and the benefits of a vegan diet. Accommodations: The Watkins Glen Harbor Hotel offers a quiet reprieve along the calming waters of the southern end of Seneca Lake. This Four-Diamond AAA-rated hotel was named a "10 Best Waterfront Hotel" by USA Today and its readers in 2016. It&apos;s conveniently located within the Finger Lakes Wine Country and just three miles from Watkins Glen International. 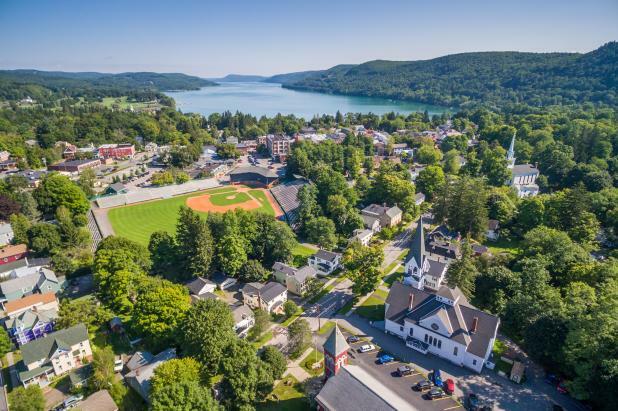 Nestled at the foothills of the Adirondacks, just south of Lake George and just north of the state capital Albany, Saratoga Springs offers top-notch lodging, dining, and cultural attractions all with a backdrop reminiscent of a Norman Rockwell painting. It can only be described as a beautiful destination. 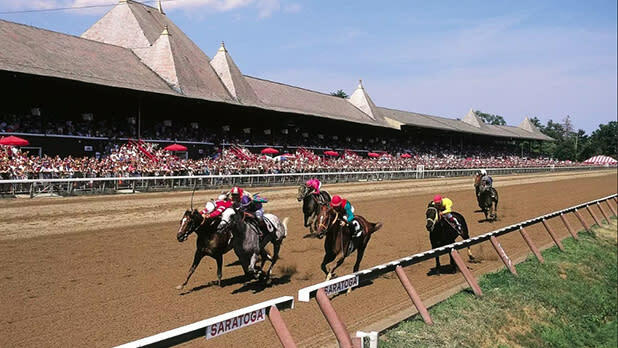 Day 1: Experience the thrill of thundering hooves as the finest Thoroughbreds in the world compete at Saratoga Race Course (open July 20 to September 3 in 2018). Much more than a horseracing venue, an afternoon at the course means being a part of a festive atmosphere that includes great local food, live music, and people-watching opportunities galore as the locals come out in their best outfits—the competition for the fanciest hat is almost as contested as the race itself. It’ll be a trip your kids will never forget. Day 2: Saratoga Spa State Park, a National Historic Landmark, is home to bike paths, two golf courses, and a few swimming holes, including a children&apos;s wading pool. Within the park in a re-purposed bottling plant sits the Saratoga Automobile Museum where you can see some of the greatest cars from around the world. Then, head to the Children&apos;s Museum at Saratoga for an interactive learning experience that encourages parents to get down on the floor and play with their young ones. Fuel up at the Corner Café near Congress Park on Church Street for a deliciously simple lunch. Day 3: Just 25 miles outside of Saratoga Springs you’ll find epic fun at the Great Escape and Splashwater Kingdom, chock-full of high-octane coasters and water rides to keep your whole crew screaming with joy. Have lunch at the park, or duck out and go to Hattie’s, a local restaurant with a storied past dating back to 1938. Hattie’s is known for its fried chicken, being the winner of the Food Network’s Fried Chicken Throwdown with Bobby Flay, and its original time-tested recipes for sides like collard greens and macaroni and cheese. Accommodations: Adelphi Hotel is a historic Saratoga treasure reimagined for a 21st-century experience. Guests can expect fresh, local ingredients featured in the hotel&apos;s restaurant, the Blue Hen, and luxuries like heated towel racks and toilet seats in each guest bathroom. Rich in history as well as architectural and natural beauty, Buffalo is the perfect destination for the whole family to expand their horizons. In the "Queen City", you’ll never run out of places to go, things to see, or stories to uncover. Day 1: Get acquainted with the locals—the local animals, that is—at the Buffalo Zoo, the third-oldest zoo in the U.S. Special encounters are offered for an extra $10 to get up close and personal with the zoo&apos;s giraffes and rhinos while learning about the animals and the zoo&apos;s conservation efforts. The education continues with an afternoon at the Buffalo Museum of Science, where it&apos;s disguised as fun. Kids can play games that teach them which healthy foods to eat, observe changes in their own heart rates after activities, and experience the gusts of a tornado and a hurricane in a wind chamber. Finish up the day by strolling Canalside and dining at Liberty Hound with views of naval ships USS The Sullivans and the USS Little Rock. Day 2: You&apos;re so close to Niagara Falls, don&apos;t miss your chance to see one of the country&apos;s most jaw-dropping attractions. Spend the day at Niagara Falls State Park where there are a variety of activities depending on what your family is into. There are 15 miles of hikes, plentiful gardens, and viewpoints galore. Grab tickets for either a Maid of the Mist or a Cave of the Winds tour for the full Niagara experience. For dinner, treat yourself to the original Buffalo wings at Anchor Bar, with locations in Niagara Falls or back in Buffalo. Day 3: Spend your last day right outside of Buffalo at Darien Lake Amusement Park. With a water park and rides for kids (and adults!) of all ages, you’ll laugh, scream, and create memories to last a lifetime. Then head back into town to Larkin Square for dinner, live music, and local shopping. It’s the hopping city center that will make you want to stay in Buffalo forever! 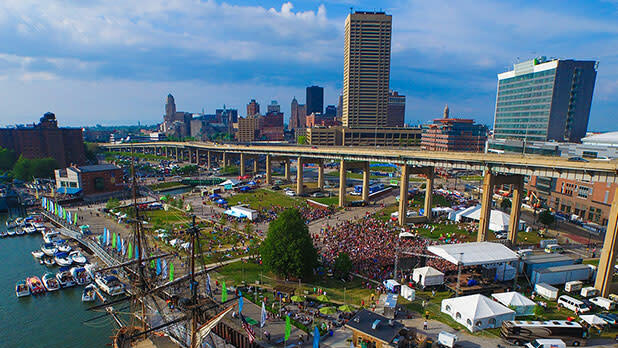 Accommodations: Stay downtown at the Buffalo Marriott HARBORCENTER to be within walking distance of the scenic small boat harbor, Lake Erie, and Canalside. Luxurious rooms with lake views are available. Long Island’s own vineyard-studded North Fork is the perfect weekend destination for the inner gastro snob within all of us. With exciting outdoor activities, your kids will stay entertained the whole visit. Spend your weekend sampling New York State varietals and locally made dishes, hitting the beach to sunbathe, and kayaking on the bay. Destress in the midst of this farmland’s natural beauty and bounty. Day 1: Time to load up on sunscreen! Spend the day on Gardiners Bay, a rare maritime forest with red cedar, black-jack oak trees, and prickly-pear cacti. Explore by foot or rent a kayak or canoe from Eagle’s Neck Paddling Company. Use Long Island’s Wine Country guide to pick a perfect winery and start sippin’ while you lunch. Day 2: Visit Lavender by the Bay in East Marion for a day of frolicking and relaxation. 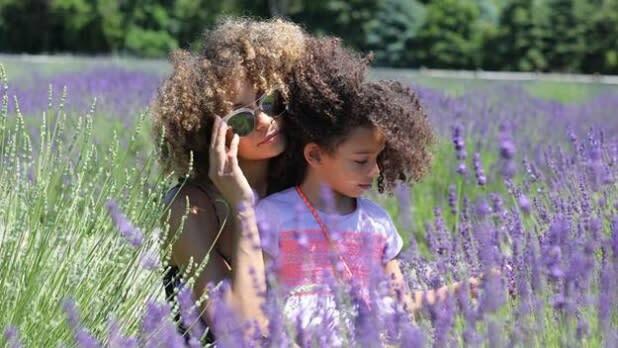 It’s New York’s premier lavender farm and one of the largest in the entire country. Meander through the gardens and enjoy a snack in the fields, all while soaking up the sunshine and taking in the soothing lavender scent. Bring a camera—your little ones will look great next to all of the purple. Grab breakfast or lunch at Sterlington Deli, one of North Fork’s best. Enjoy a wide range of deli classics including their much-loved sandwiches. Day 3: Head to Splish Splash, just outside of the North Fork, for 90 acres of summer fun. With 30 rides and runs open during the season, there are new adventures to be had at every twist and turn. After you’ve worked up an appetite, take advantage of the local vineyards and farmland with a lavish dinner at North Fork Table. Taste seasonally inspired American dishes made mostly with produce, meats, and fish local to the area. Accommodations: Stay at the Blue Inn at North Fork for a quaint, pet- and kid-friendly stay amidst beautiful natural surroundings.